I’m going to be like everybody else here and talk about a few New Year’s goals (even though I know I am a few days late). I have many goals but this post is dedicated specifically to my beauty routine. Why beauty? Because a new year means another year older and let’s face it, I am not getting any younger. So heading into 2018, I am going step up my beauty game and ensure that I keep my skin as youthful as possible. I just discovered this brand, Tata Harper, and I love that they make products that are luxurious and effective, without the use of synthetic chemicals. I have been using the Regenerating Cleanser from this line for about two months now, and I really love it. This cleanser gently exfoliates with apricot seed powder, removes buildup with pink clay and pomegranate enzymes, and refines pore appearance with white willow bark. It’s super gentle so you can use it everyday and after I wash my face, my skin feels refreshed, hydrated, and glowing. What is this device? Looks cool and sleek but what does it do? NuFace delivers microcurrents to your face to go deep into your skin to tone facial muscles to improve skin tone, sagging, wrinkles, and fine lines. I actually think the mini size of this device is big enough for all face sizes so save yourself some money and get the mini versus the full size. I’ve been using it for about two weeks but didn’t take any “before” photos until after I started. Once I hit my 60 day marker (where NuFace says you should see results), I will take an “after” photo and compare for differences and lifting. The On The Glow set includes a few travel sized add ons like the Gel Primer, the Prep and Go wipes, Anti-Aging Infusion Spray, and the Lifting Vitamin C & Hyaluronic Acid Serum. 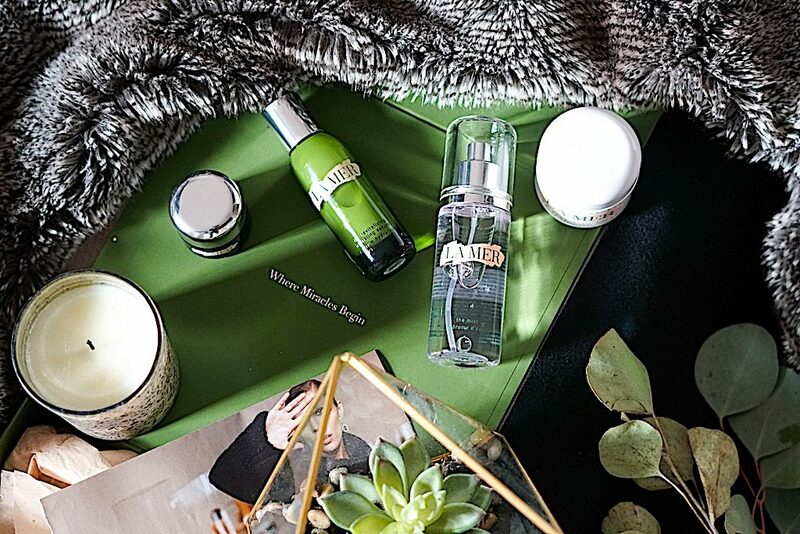 As you know, I am a huge fan of La Mer products (see my post of the La Mer hype here). While I’ve been using their Creme de la Mer, Eye Concentrate, and the Serum Essence, I just added The Revitalizing Hydrating Serum and The Mist to my winter skincare routine. Prior to using the Revitalizing Hydrating Serum, I was using the Kiehl’s Midnight Recovery Concentrate in the evenings. While I still use the Kiehl’s serum to mix with my foundation to make my skin more dewy, I love the velvety and less oily feel of the Revitalizing Hydrating Serum. 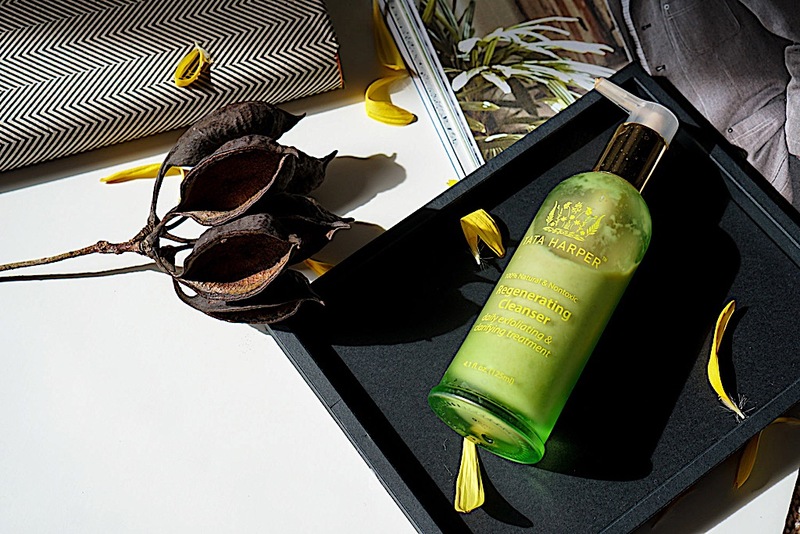 The Lime Tea Concentrate ingredient in the La Mer serum is a powerful antioxidant to protect and fight against environmental aggressors. Like all of La Mer products, this serum heals and repairs skin. Since our skin tends to get more dry in cold weather, The Mist is great to lock in moisture after I’ve put on all my other skincare products. It also is a great refresher mid-day when you feel dry or need like your skin needs a boost of balance. As we all know, the sun is the enemy. Sun is the major cause of aging and wrinkles and even though I religiously put on sunscreen every morning 365 days a year, it’s not enough. You are supposed to apply some type of sunscreen to your face every 2 hours! I know that seems often, and quite frankly, who likes to put on sunscreen on top of makeup that has been on for a few hours?! 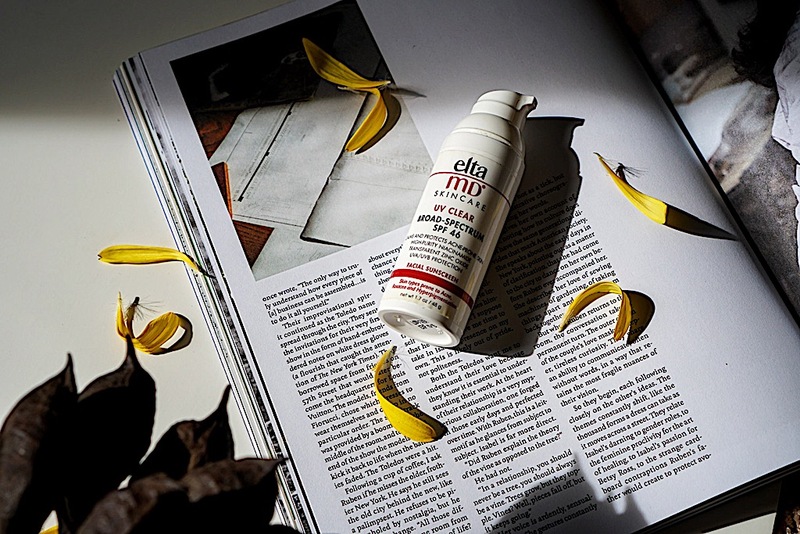 My go-to sunscreen is Elta MD. I love the lightweight feel of this sunscreen, plus it has no “sunscreen” scent to it, and it is recommended by so many dermatologists (trust me, I’ve been to many and I always see this specific brand at their offices). Most days I don’t wear makeup so applying sunscreen every two hours is not a biggie, but on days I do have makeup on, I put on a powder with SPF for that added protection. So these are a few things that I’ve added to my skin care regimen this year. I would love to hear if you’ve tried any of these and your thoughts or if you have any must-try recommendations for me in your comments below! One of my main goals is definitely skincare too! Absolutely love your reviews. I’m currently using nuface products and I absolutely think it’s works! What a great post! I love the reviews, I’m always down to try new skincare products! I love reading about what skincare products are working for people! Always wanted to try to La Mer but the price tag is a bit steep. Now that I’m starting to get some fine lines around my eyes though, maybe it’s time to take the leap! I have super oily skin though, so I’m not sure if something so emollient is ideal for me. Definitely going to check out EltaMD sunscreen!! I’m a sunscreen junkie too but I had NO IDEA that we are supposed to reapply every 2 hrs. If I’m outdoors I usually have make up on so I need to look into the powder you recommended as well. I really want a sunscreen mist that goes on nicely over make up but the ones I’ve tried have left me super greasy! Can’t there be a setting spray with sunscreen that has a nice matte finish?? Thank you so much for sharing all of these great products and the thorough reviews! <3 🙂 Taking good care of your skin is so important, but I know a lot of people don't take their skincare regimen that seriously I'm so glad that you shared some of your personal experiences in using these products! I love this list since I have been looking for better products to improve my skin tone and now I’m also looking for anti-aging products more, especially with less sleep, more travel, changes in climates everywhere! I got the NuFace product back in December and haven’t used it consistently yet. I’m curious to see how it works for you in 60 days! I haven’t tried Tata Harper yet, but that sounds amazing. Need to check it out once I run out of my cleaners. I hope you had a great holiday and that 2018 is your best yet! The skincare looks awesome. It sounds really good. I’ve pretty much tried all except the Tata Harper cleanser and sounds like I should check it out and try it. I agree that NuFace gel runs through so quickly so it is great to know that Aloe Vera is a good alternative! I haven’t been doing this regime everyday but I do feel like my skin is tighter on the evenings that I use it. Great review and recommendations! Skincare is my major goals for this year, I am trying to get into organic products more! I need to check these products out! I love the bottle it comes in! Also, it is so hard to find great products without harmful chemicals in it and this product is definitely on my list to try! Also i’ll have to try the powder spf sunscreen because it is impossible to put on sunscreen when makeup is already applied. Great post babe!! 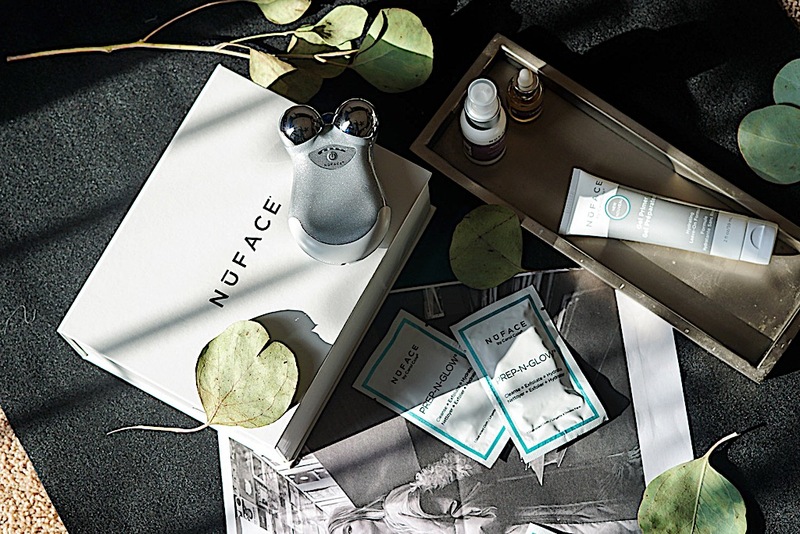 I actually just wrote about Tata Harper and NuFace in my blog post on 2018 beauty trends haha!! These are definitely going to be HUGE 🙂 I’m loving NuFace so far..and their exfoliating wipes are amazing too! Sooo many good about their products. Looks amazing I want to take care of my skin routine! Hi Christine! Thank you for sharing. I love reading about different skin care regimes. I recently received the NuFace device and can’t wait to try it so was thankful for reading your review so now I know what to expect. I too am asian and sometimes we can get away with good-looking skin without alot of care. But I don’t want to rely on my mom’s good genetics and be more proactive! Wow the NUface looks so cool, I was thinking I might get a Jade Roller but might opt for this one instead!! Top products! I want to try La Mer serum, I should get a hold of it. Thanks for inspo babe! I love La Mer as well! But, I have not tried either of these! The serum sounds awesome! I might have to invest one day. Same with the Nu-Face system. Keen to hear how you get on with it. I have heard a lot of things that have already added it to my wish list! This is quite a comprehensive review dear. Love that you included pros and cons, it’s really honest and genuine. Thanks for sharing. Also, your photos are on point. Nicely done! I love reading everyone’s winter skincare recommendations so it prepares me for Australian winter! So many cool brands, and products I’ve never known! Wow this is a great review. Best is that you included pros and cons. I am a huge fan of the la mere eye cream. I use it for 8 months now and would not use an other one. I totally favour your serum, it sounds amazing! Skin care is so important, I really want to keep the skin soft and radiant. I’m such a newbie when it comes to skin care. I’ve only heard of La Mer and although I haven’t tried anything from that line, I only hear great things about their products. I love hearing wheat kind of products other seasoned skin care artists are using because I’m so clueless! I will definitely check out Nuface and Tata Harper. I love that Kiehl’s Midnight Recovery Serum. That’s a product I know and use. It smells soooo good. I’m going to have to try all these recommendations! Great post, thanks for sharing 🙂 I would love to try some of these products! It typically doesn’t take much cleanser for my face anyway, so the pricey factor doesn’t bother me much since it usually lasts so long. I have never heard of Tata Harper before now, but I may need to check out that cleanser! I have also been seeing La Mer everywhere and people raving about how great their line is for all skin types. I must say that Revitalizing Hydrating Serum sounds like it would be a dream for my dry skin! This is such a nice and detailed review. It’s definitely a little pricy but I guess it’s worth the investment. Healthy skin is also on my radar for the new year! Time doesn’t wait for anyone! Thank you for sharing pros and cons on your beauty products! I have heard a lot about the NuFace. I have been looking into buying! Thanks for the heads up on getting the smaller one! Skincare is one of my goals this year too! Thanks for sharing this babe, very helpful! I’ve never heard of this brand. Now I’m searching for a perfect cleanser as my old ones don’t make my skin feels refreshed, hydrated, and glowing. I’ve checked the site of Tata Harper and now planning to order that cleanser. Sounds like a perfect beauty product! I actually using one with ultrasonic and nutri + system and my skin improved a lot. After this any test that I make I saw my skin hydratation level results always perfect. Absolutely agree. These products all sound amazing; I need to add them to my routine! I love La Mer, so I’m sure I’ll love that product! These products sound really amazing! Reading this post reminded me how important skin care really is and that’s something I really want to work on this year. Thanks for sharing!